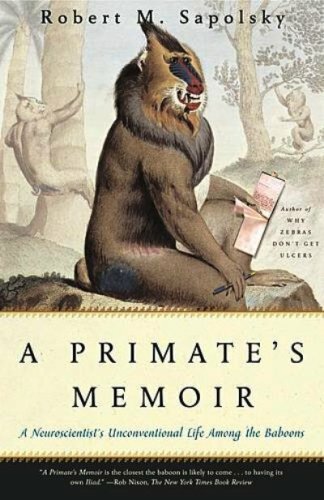 This book is exactly what the title says it is, the memoirs of a primate – the human Robert Sapolsky – and his adventures over a couple of decades of baboon research in Kenya. It’s a collection of stories, many about the almost-human-but-not-quite goings on in the community of baboons that he studied, but many others about Sapolsky’s adventures within the human community, in Kenya and in other parts of Africa. He is a hell of a storyteller, and although there is a lot of sadness, corruption, fear, and unnecessary misery revealed in his stories, there is also much that is chortle-out-loud funny. Sopolsky writes with gusto and humanity, and is careful to make sure we understand that his friends and heroes are not angels and that his worst villains have reasons for doing what they do. He mourns the passing of the “old Africa,” or at least the Africa of the early 1970s, while noting that the Africa of the early 1970s was in many ways a pretty miserable state of affairs. He regrets the fading of Massai cultural integrity, while acknowledging that a big part of Massai culture was the practice of making life nasty, brutish, and often rather short for their agriculturalist neighbors. Sopolsky seems to see more of the big picture than most of us, and he speaks with bracing fairness; he laughs in admiration at the skill or imperturbability of those who have taken advantage of him, and admits with regret the times that exigencies have forced him across his own moral frontiers. Implicit in the weaving together of baboon tales and human tales is the notion that we primates are not so very different from each other. The baboons are individuals with complex relationships and behavior driven by need, avarice, and caprice; so are the humans. Sapolsky never makes the point directly, but he gives us signposts in the title and in the four sections of the book, in which periods of Sapolsky’s own life are described in the technical nomenclature for various stages of baboon development. Hurray for the Reading List, as this is not a book that I would ever have thought to read on my own. I’m not much of one for non-fiction, and certainly not for natural history. But I found A Primate’s Memoir a delight, funny and educational and moving and wise. Recommended for primates with the capacity for written language. The Reading List Continues: With The Travels of a T-Shirt in the Global Economy still in a long library queue, I've started into the His Dark Materials trilogy. Neil Postman's Amusing Ourselves to Death is waiting in the wings. I've never heard of this book, but I read a lot of non-fiction and love natural history, so I will seek this out! Thanks! Where DO you get your reading list? Elaine, the Reading List was compiled by reader vote in the summer of 2007. The categories were modern fiction, classic fiction, non-fiction, very old books, and sprawling fantasy epics. This sounds like an awesome book. As a huge fan of non-fiction books, I'll have to put it on my list. Sounds like quite the find. I'll have to put it on my TBR list. Jenners, have you talked to anyone about your short-term memory? Frankly I'm concerned. Dr Sapolsky has created a masterpiece with this book. I enjoyed it thoroughly. Check out my review of the book.